The second half of the day was an altogether different experience. At the risk of sounding melodramatic I have to provide a warning about these next photos. Some of you may find them rather disturbing. On the previous afternoon Nymoan spoke to me about the people across the lake (insert eerie music here) who reside in the village of Trunyan. 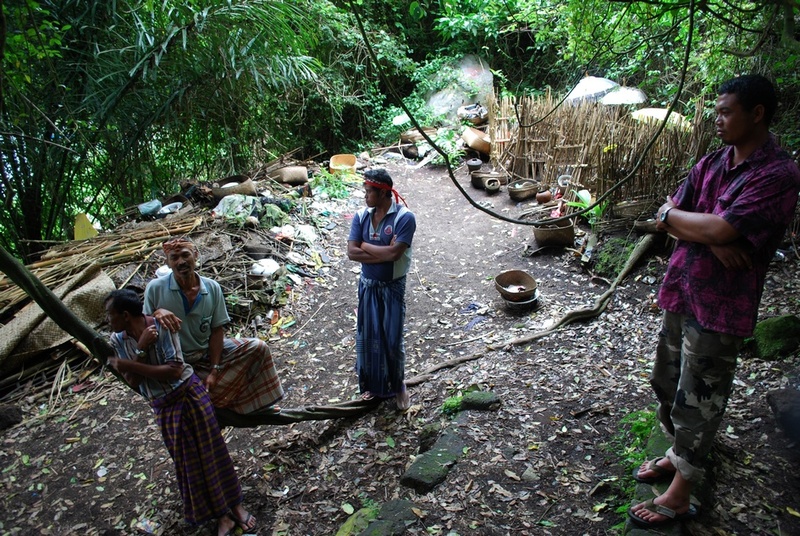 The residents are reputed to be descendants of the Bali Aga, the original inhabitants of the island that predate the arrival of Hinduism. They are well-known for, among other things, their unique ‘burial’ methods, which is to say no methods at all. 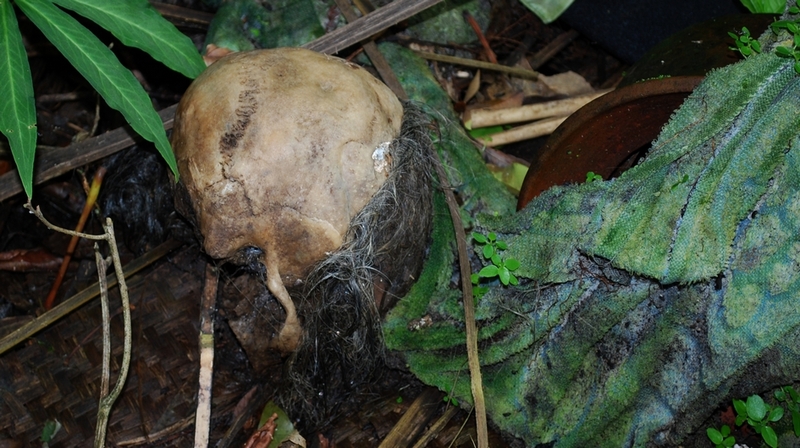 Bodies of the recently deceased are merely placed on the ground in the ‘cemetery’ to decompose naturally. 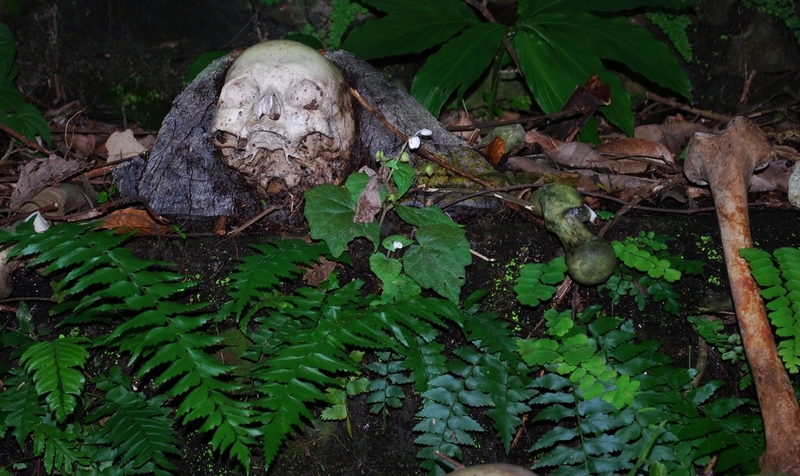 The dearly departed are first laid within a bamboo enclosure and allowed to decay slowly. 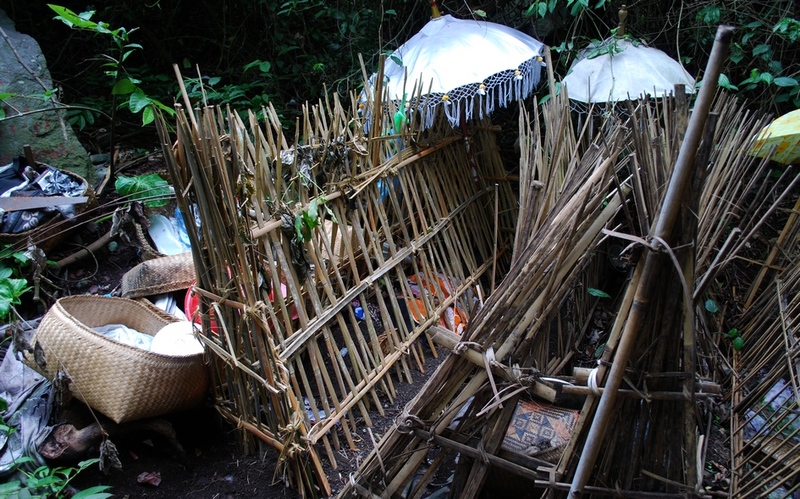 When the process reaches a certain stage or if more space is required (I was told there is room for eleven bodies at a time in separate bamboo pens) the bones are placed in a pile adjacent to the enclosures until most of the flesh has rotted away and the bones are relatively dry. 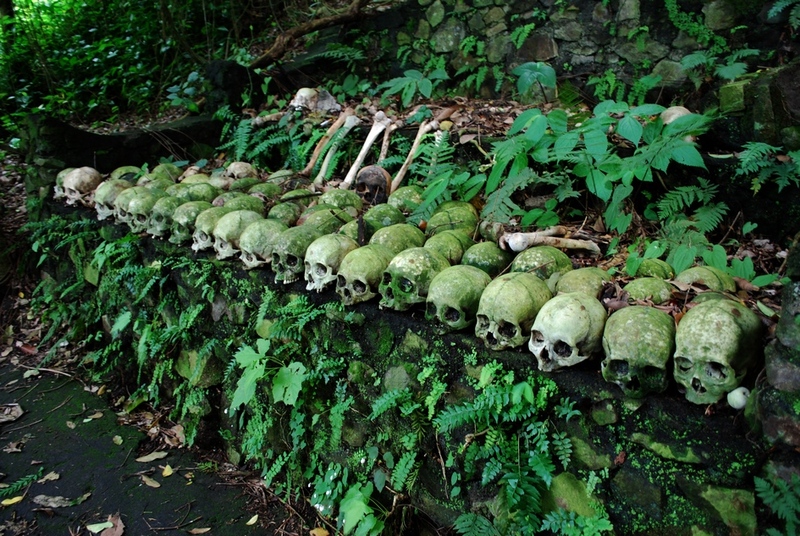 When all the flesh has dissolved they stack the bones in the designated area, lining up the skulls in a nice neat row. 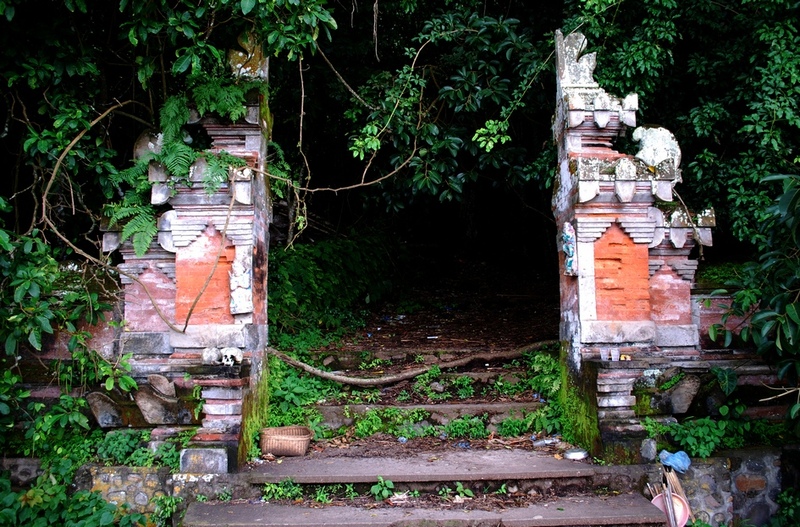 The village of Trunyan, its corresponding cemetery, and a few sub-villages, are located on the east side of Lake Batur. There are two ways to get there. 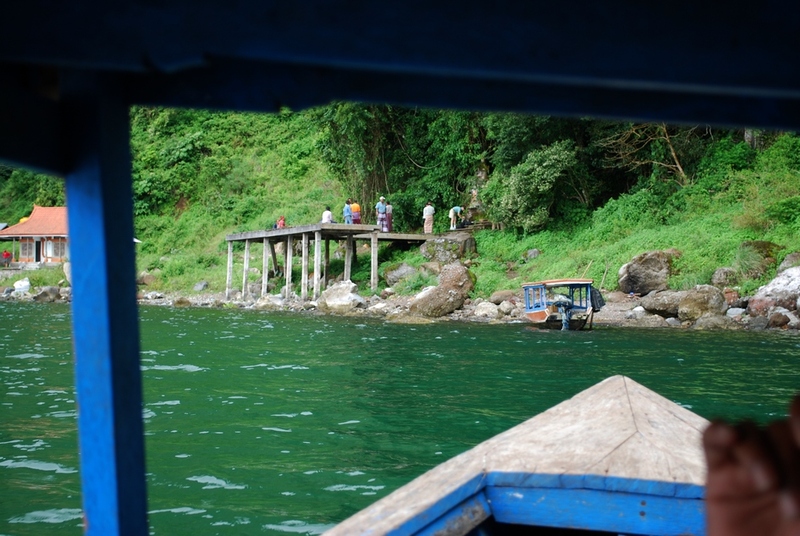 You can either take a twenty-five minute boat ride from the village at the south end of the lake or you can make your way around on the dilapidated road to the village where you can hop on a boat to the cemetery (less than 10 minutes). As the village and the cemetery are abutting the outer edge of the largest and most ancient caldera the only avenue of approach to the cemetery is by water. 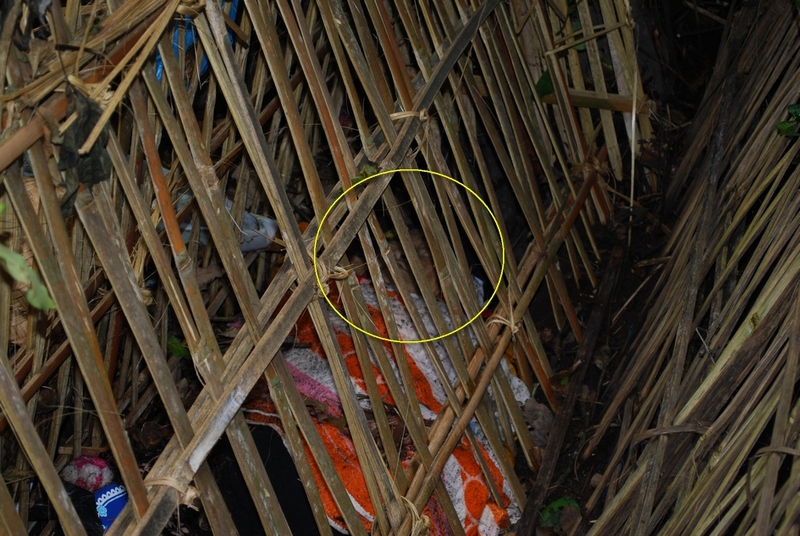 When I arrived there was one occupant (a woman I believe) resting quietly in her bamboo ‘hut’. 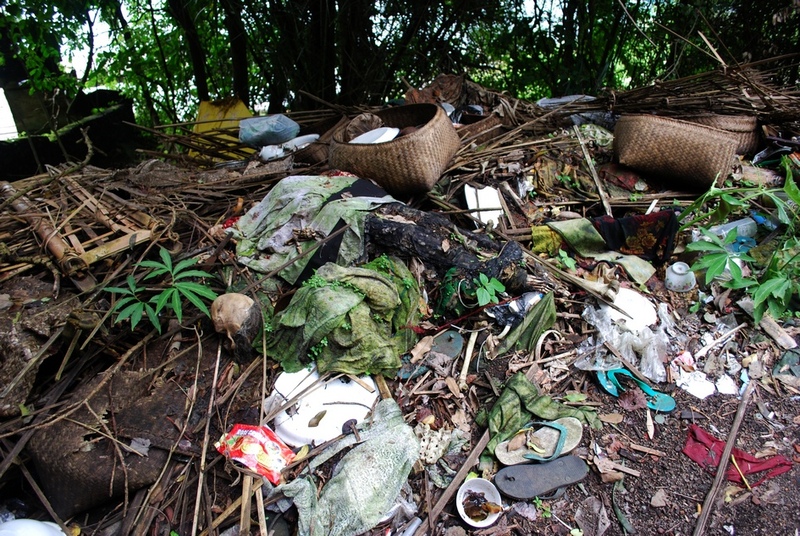 The piles I mentioned look remarkably similar to a heap of trash. 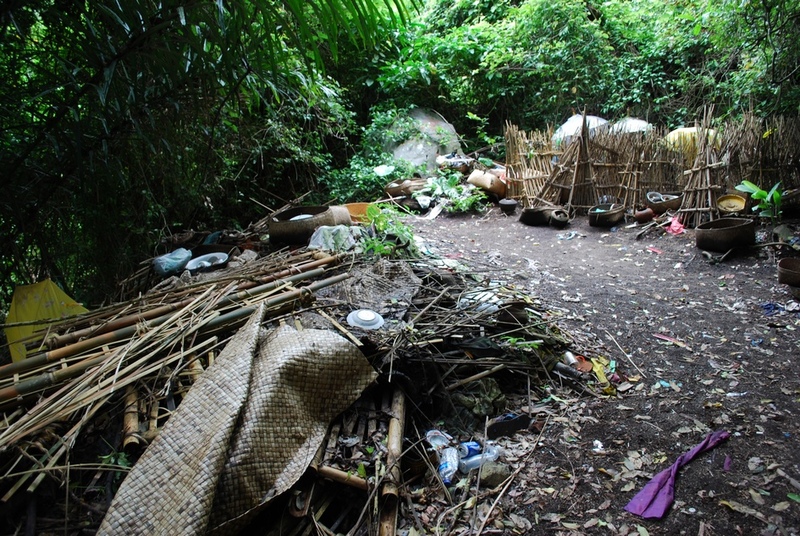 When people from the village pass away their belongings are gathered and placed with them. However, the secondary ‘waiting area’ appears to be nothing more than a disorganized pile of junk and bones. 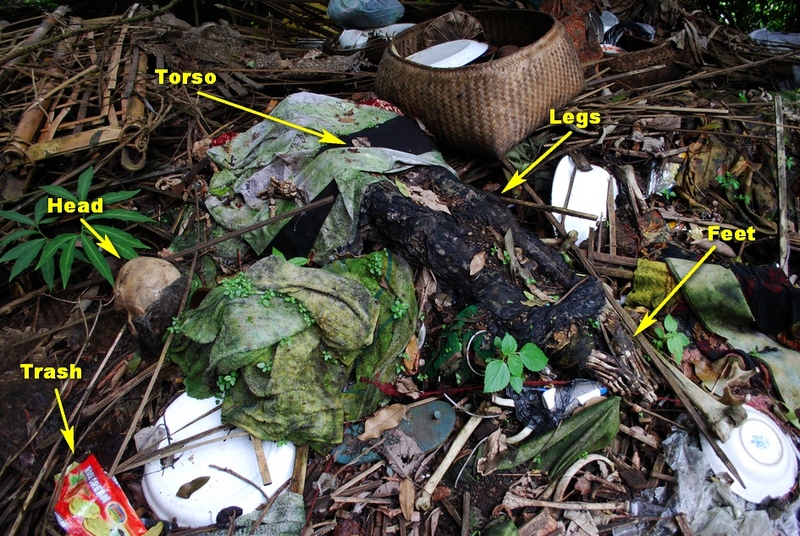 Dishware, clothing, pieces of furniture, bamboo shards, humeri (arm bones), femurs (leg bones), skulls and cadaver parts are strewn about haphazardly. I also spotted a rat milling about. Reincarnation? You would think that the whole area would be engulfed in the stench of death but it is not so. In fact, the smell wafting through the scene is borderline fragrant. Why? It has to do with the large tree growing nearby which apparently neutralizes any distasteful odors. I was told that it was a Banyan tree but upon further reading have seen it referred to as a Taru Menyan (‘nice smelling tree’). Two names for the same tree? Dunno. Some unknown biological process (unknown to me that is) dissipates the foul smell that normally accompanies putrefying flesh. I was thankful for that. After the bones are dry enough (not sure how that is measured) they are picked from the pile and placed in the alter-like showcase (for lack of a better phrase). By then they should be completely free of tissue (Actually, one of the skulls appeared to still have a bit of matter clinging to it). This is their final resting place ….. sort of. This cemetery lies at the bottom of a ravine right smack between the outer crater and the lake. I was told that every few years or so there is particularly heavy rainfall resulting in flooding. Subsequently, much of the remains may be washed into the lake after which the stock pile begins anew. Scuba diving anyone? To be honest, I was surprisingly freaked about the whole thing. I just did not know what to make of the situation. Here is this open air natural mausoleum filled with disorganized death and, oddly, open as a tourist attraction. 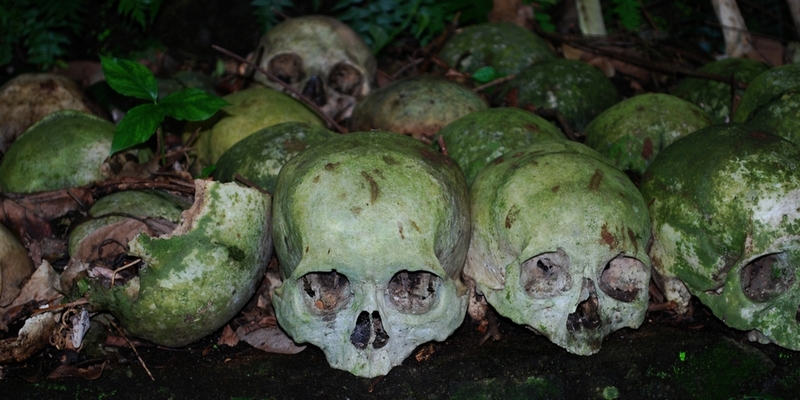 While I was there numerous camera toting tourists came shuffling through, having their picture taken next to the pile of skulls. My guide offered to take one of me but I just could not bring myself to go through with it. One woman (an Indonesia tourist) even asked if I would pose with her next to the Banyan/Taru Menyan tree. I am not exactly sure why. Must be my devilish good looks. Yeah, that’s it. I did take pictures, a lot of pictures. Should I have? I don’t know. What if I was working for National Geographic? Would it be okay then? 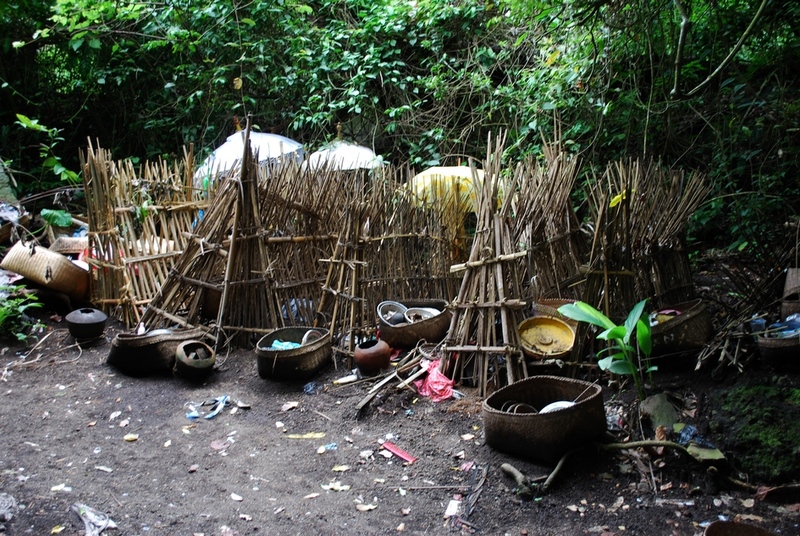 This village is notorious in Bali for its avaricious inhabitants. As a matter of fact they even hassle other Indonesians. I found out later that I was screwed royally for the price of the boat ride. I paid the same price for the ten minute ride that I would have from the south end of the lake (around $35 US). Dum-duh-dum-dumb. The locals standing in the cemetery also have a donation basket as well. The guide later asked for a bit more money for himself claiming he received no share of the boat fare. And, like an idiot, I believed him. I think it is safe to say they exploit foreigners’ preconceived notions concerning the sanctity of the deceased. I have already mentioned that the Balinese as a culture have a different view of death along with the requisite funeral rites and ceremonies. Cremation ceremonies are open to all and a joyous occasion. I guess it was the capitalistic nature of this enterprise combined with the rotting flesh that really got to me. Did my guide tell me the whole truth? Was the scene authentic or did the locals manipulate the setting a bit (say for example by leaving bodies exposed and thrown haphazardly about in order to captivate tourists)? Did the rain really wash bodies into the lake or are they thrown there intentionally to make more room? I hope they maintain the true tradition even in the face of tourism profits but my Spidey sense was tingling. I was so disheveled by the scene that I forgot I could take video with my smaller camera and even failed to get a picture of the miraculous tree. When I returned to the village I mounted my motorbike and got the hell out of there as fast as I could. I felt a little bit like I participated in a sort of conspiracy to commit sacrilege and wanted to separate myself from the scene of the crime, so to speak. I needed some reference pictures of this place: these were super helpful thanks!